We ride hard for the Universal Soldier films here at The A.V. Club, though not the 1992 original so much as its direct-to-video sequels like Universal Soldier: Regeneration and Universal Soldier: Day Of Reckoning. 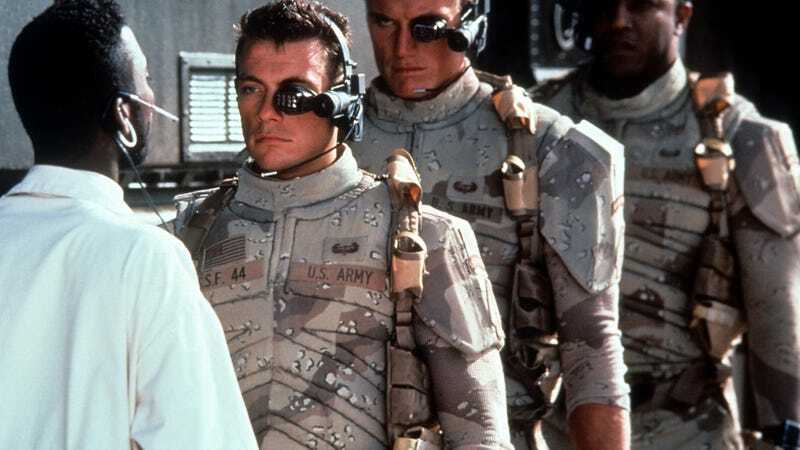 “On almost every level, the 21st century iterations of the Universal Soldier series are more exciting, more inventive, and more essential than their theatrical forebears,” our own Alex McLevy wrote back in 2015. It’s with an arched eyebrow, then, that we inform you that the series is apparently getting a reboot. Richard Wenk, the screenwriter behind Denzel Washington’s Equalizer franchise, told Discussing Film that his take is not a “remake” or a “redo,” but, rather, a “re-imagining.” Comparing it to his work in adapting The Equalizer, he said “it’s the title that inspired me and not the movies.” Hm. It sounds as if his version will bear little resemblance to the mythology of the original, which is odd considering that, for us, at least, broad, contextless words like “universal” and “soldier” summon only the lean torsos and bruised muscles of Jean-Claude Van Damme and Dolph Lundgren, who in the original played a pair of dead Vietnam soldiers who are reanimated with cyborg parts. Here’s hoping they’ll have a place in Wenk’s vision, no matter what it ends up being. St. Vincent and Carrie Brownstein wrote a tour comedy about "heightened versions of themselves"